My lifelong affair with the Isle of Thanet, and Ramsgate in particular, began in the late 1940s. The war was over, though food rationing had not completely stopped and people were getting their lives back together after six years of destruction and unimaginable heartache, bereavement and separation. The beaches that had been the repository of tank traps and coils of barbed wire, the last desperate defence of our country, had been returned to sandcastles, deckchairs, and families enjoying a real seaside holiday. For me, like many children born during the war, it was my first experience of the beach; the warm sand and the soft waves washing over my feet were a delight of which I never tired. Our summer holiday began in the icy cold of west London in January, when the coach booking had to be secured for a journey that we would not embark on until July. As the date for our holiday grew nearer, mother would wash and iron and fold our clothes and they would then be piled neatly on the spare bed ready for packing. I was not allowed to change my dress for the week before the holiday, but was instructed to keep it clean because, as she said, “I can’t be washing it before we go.” Dad was in the same predicament with his shirt and knew better than to put on a clean one during that most important week! We left on a Saturday morning, arriving at the coach company’s depot in Uxbridge Road in good time. Once all the passengers were on board, once all the suitcases had been stowed, and once the children had been asked for the umpteenth time if they needed the lavatory, we were off! The journey took us across London over the Thames and down the Old Kent Road towards the ancient Roman road of Watling Street, known along part of its route as the Rochester Way. In those days, motorways were still the dream of civil engineers and it would be almost another 20 years before the opening of the M1, Britain’s first motorway. In the meantime, the nightmare of the Rochester Way was ahead of us. The road was the 1940s version of today’s M25. During the summer, traffic travelling to the Kent coastal towns was always delayed, often by hours:hold-ups of such duration that the men would get off the coach for a pint while the women and children hopped off to buy ice-creams and fizzy drinks from roadside vendors. Finally freed from the constraints of the Medway towns, the coach would take us through the rich farmlands of east Kent. The kids, tired, sticky and tetchy would perk up at the possibility of being the first one to see the sea! What a treat that was. Looking back it seemed as though the sun always shone on the water, creating a sparkling expanse of blue sea on our left hand side as the coach approached its destination. In Ramsgate, the coaches rolled into town one behind the other like a multi-coloured, wheeled armada. Into the middle of the town, negotiating narrow streets and tight bends, we finally arrived at the area, somewhere around Boundary Road, I believe, that served as the coach station. Happy to be free of the coach everyone quickly collected their luggage, tipped the driver (not mandatory but a thing people always did back then), and prepared to depart for whichever boarding house they were booked in to. Hanging around the emptying coaches were groups of young boys and men, many with homemade trolleys and wheeled carts. These adroit individuals would manoeuvre their carts into the paths of arriving passengers and offer loudly and determinedly to transport suitcases to the correct boarding house – for a price. It was an unspoken rule that Dad would always carry our suitcases, so we had to run the gauntlet of offers of help while avoiding tripping over carts. Of course, long before our arrival in Ramsgate, mother had ensured we had somewhere to stay. Once good digs had been found, people tended to return year after year to the same boarding house. Letters would be written during the winter and if there were a vacancy, a deposit in the form of a postal order would be dispatched. Most landladies provided bed and breakfast and an evening meal. Remaining around the house at other times was not encouraged. In fact it was usually expressly forbidden, regardless of the weather! My parents and I would be given a double room with most often a camp bed for me in the corner. The room would have a wash basin, but the lavatory could be anywhere, even on another floor, and there was never the offer of a bath during the entire two-week holiday. Nor was the bed linen changed, and boarders were expected to make their own beds every morning. Some landladies served early-morning tea, put down on the floor outside the room, accompanied by a tap on the door. Mum would wash the cups and return them to the kitchen. One memorable holiday was spent boarding with several other families in a large house in Dundonald Road, Ramsgate. After three mornings when the only breakfast on offer was baked beans on toast, the male boarders rose up in protest and took over the kitchen! The landlady was instructed to shop for cereal, milk, bacon, eggs etc, and the men took turns in cooking each morning. While some food items remained on ration, the guests had to hand in their ration books to the landlady in order for her to buy enough food. Ramsgate in the 1940s and 1950s was teeming during the summer season and there were many activities for visitors. One entertainment was Freddie Hargreaves’s orchestra. A stalwart in Ramsgate for many years, Freddie and his singers and musicians entertained each afternoon at the open-air bandstand on the West Cliff. In addition to the songs, jokes and popular music, a talent show was held, usually including singers, tap-dancers, acrobats and the occasional harmonica player. In the evenings, the same musicians played at the East Cliff bandstand, a large outdoor venue in front of Wellington Crescent where the audience was able to dance. These entertainments were very popular and attended by thousands of people throughout the summer season. During the 1950s and 1960s, there were also two cinemas in Ramsgate, and live stage performances at The Granville Theatre on the East Cliff. I believe the Granville also put on ice shows during the summer season. If loud bangs and oohs and aahs were your thing, Ellington Park was the place to be for the weekly firework display. Down at the harbour we used to enjoy walking around looking at the boats moored there and felt well entertained if the swing bridge between the inner and outer harbours opened to allow a vessel to leave or enter. At that time, French fishing boats were regular visitors to Ramsgate, the crews wearing blue overalls often with more patches than original material and wooden. The numerous pubs across the town did exceptional trade throughout the season. With children strictly prohibited from entering licensed premises, youngsters could be seen sitting on pub steps with their glasses of lemonade and bags of Smiths Crisps (with the salt in a wrap of navy blue paper among the crisps). Our holiday would not have been complete without a visit to the model village, on the West Cliff just past the Regency Hotel. It is sad that the village no longer exists because I believe it would still be enjoyed by the kids of today. One year we went to the summer fete at St Augustine’s Abbey in Grange Road. I can still recall how happy I was winning a plastic butter dish for my mother but cannot remember what act of skill I completed to win it! In Ramsgate town I loved to watch the men making rock. The rock shop was in Harbour Street and the process could be seen from the street through a large window. Great hanks of pliable candy would be twisted, stretched, and thrown across the large metal table. It looked like very hard work that took a lot of skill. Just past the rock shop was a Lyons cafeteria, which was always crowded. A meal in there was a great treat, as we never ate out except during our holidays. I remember having a portion of chips in a small oval china dish. On the other side of the road was the department store, Lewis & Hyland. The season must have been their busiest time. There were always amazing sales with colossal reductions in clothes prices. I would imagine that with the end of clothes rationing after the war people would have been happy to be able to buy all they could without the trouble of providing coupons. My parents, like many other holidaymakers, always took advantage of those sales. For those who wanted to venture further afield, the East Kent Road Car Company ran both the service buses and a fleet of coaches. Some of the coach trips took the holidaymakers away for the whole day while others were afternoon or evening trips – often called ‘Mystery Trips’ for some reason. A favourite evening trip was a visit to the Minster lavender fields where lavender soap, perfumed water and little bags of fresh lavender could be bought as souvenirs. Most of the trips involved a stop at a country pub. Only time for one drink so there were never any drunks on the coaches! Another favourite annual trip was to Sandwich. We rode the bus there from Ramsgate and loved looking at the ancient buildings. We would chose to go on market day so I could enjoy walking around the livestock pens, stroking the sheep and listening to the auctioneer as he rapidly sold off the pens of animals. The livestock market is long gone and there is a car park where the cattle used to stand awaiting their fate. We did a lot of walking while holidaying in Ramsgate, with regular treks taking us to Pegwell Bay, where people still grew vegetables and fruit and sold them from their gates. A favourite purchase was a bag of enormous, sweet and juicy desert gooseberries. Going in an easterly direction from Ramsgate, we used to walk across the cliff tops to Broadstairs, a more gentle and less frenetic resort than its neighbours of Ramsgate and Margate. I loved the stables on the clifftops at Joss Bay; it was there that I rode a horse for the first time. In those days, it was possible to obtain a passport that was valid for one day. For my dad and me, this opened a whole new dimension to our holiday. Thus equipped, we set off to sail for foreign parts. Mum, being a martyr to seasickness, did not venture with us but took herself off on a coach trip. These day trips enabled us to visit Calais one year and Boulogne the next. I think I was able to travel at a reduced rate because I collected coupons from Girl magazine through the year. Boys who read Eagle could also collect coupons. At times during the 20 years that followed the end of the war, Ramsgate’s municipal airport was in operation. It was built in the late 1920s when its commercial flights operated from the facility alongside Pysons Road. It is not to be confused with what was then an American air base at RAF Manston. During one of our holidays, my grandmother came to Ramsgate for a couple of days and dad organised a flight for grandma, himself, and me. None of us had ever flown before and grandma was well up in years at the time. However, the expedition was a great success with all three of us greatly enjoying our daring adventure. At the western end of Ramsgate were very popular sandy beaches and further along were small, fascinating rock pools that were revealed at low tide. The beach there was served by an Edwardian lift that would bring people down to the promenade, great for baby buggies. At the bottom of the cliff was a café serving drinks and snacks, but no disposable cups, plates, saucers or teabags – for a deposit, the customer could take the tray of drinks onto the beach to where the family was gathered. A popular fizzy drink of the time was Tizer. 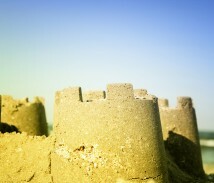 On the beach, I would build sandcastles, usually with some help from Dad. I would also make friends and play with other children while mum sat in her deckchair writing postcards to friends and relatives. If a friend or neighbour of ours did not receive a postcard while we were on holiday they could be miffed about being left out. On the beach was a boat which took people out for short trips along the coast, reached by walking along a concrete breakwater. As I walked along on one occasion, a large German shepherd dog ran past and knocked me off the breakwater into the sea! I couldn’t swim but someone quickly hauled me out and lifted me into the boat none the worse for my dip. A regular sight on the beach was the deckchair man. Employed by the council, he would come around and charge each person using a deckchair for the morning or afternoon session. He issued a ticket that rolled out of a machine worn strapped to his tummy, similar to the machines used by bus conductors. Another traditional sight on the sands was the beach photographer. Carrying a large bulky camera, he would take photos of all and sundry as they went about their business of sitting, playing, swimming, or paddling. The photos would be available at the end of the day, displayed in a kiosk somewhere nearby. With many people not owning cameras at the time those pictures would have made a nice souvenir. On the wide expanse of grass on the cliff top of the Western Esplanade, games and competitions were organised for children by employees of the Daily Mail. One of their cartoon creatures was called Flook (the strip ran from 1949-1984), a short, rotund, creature that stood as their mascot. Teams were formed and the kids competed against each other. Best of all, I’m sure, was the fact that it was no cost to the mums and dads and kept the kids occupied for a couple of hours. All the fun of the fair could be found at Merrie England, at the eastern end of the sea front, which comprised stalls, rides and candyfloss sellers designed to persuade the holidaymakers to part with their cash painlessly. Wandering along that end of the seafront, the air was always redolent with the strong smell of vinegar from stalls selling little dishes of whelks, jellied eels, and winkles; great favourites with the many Londoners who visited the town. Although much of Ramsgate is still recognisable, the rock pools are gone from below the western cliffs. Where I used to search for crabs is now a cement apron frequented by large, commercial vehicles waiting for the ferry. Land alongside Grange Road where once fields of wheat and poppies grew is now covered by houses. Ramsgate Hospital in West Cliff Road has been turned into apartments and the site where the Tomson & Wotton brewery once stood in Queen Street has long been demolished; a supermarket stands in its place. Merrie England has long been wiped from sight but not from the memory of those of us who spent some childhood holidays in Ramsgate. The large houses that once rang with the sounds of holidaymakers are now for the most part either demolished or turned in “multi-occupancy units”. Down below the cliffs on the western end, we used to play rounders, football and other ball games on the street above the sands. Not any more, that same road now trembles beneath the weight of articulated lorries and the cliff top lift has carried its last cargo of happy beach-bound youngsters. As our holiday came to its inevitable end, suitcases were repacked and we took a last walk along the prom. A tradition among boarding house guests was to have a group photo taken at the end of the holiday, addresses would be exchanged, and often a black and white photo would appear in the mail weeks later. We never could remember the names of those in the photo! Finally, it was time to go to coach. It was a hard thing to see all the happy new arrivals, their faces smiling in anticipation of the good times to come while all those of us due to leave did our best to put a brave face on the situation. As the coach pulled away from Ramsgate, I searched to get a last glimpse of my favourite places and hoped we would be back again the next year. My parents moved permanently to coastal Kent several years before they retired and my husband and I have lived in the county for more than 30 years. I continue to enjoy visits to Ramsgate and it will always be a special place.